Squash court floors and walls receive a lot of wear and tear and require regular maintenance on a day to day basis to achieve a high standard for squash players. Eventually the floors and walls will need a professional refurbishment. Floors can be easily sanded and remarked, including line markings. After proper assessment of the squash court/s during the initial site visit, works are determined taking into account budget, time and current and future activities. If a floor is to be sanded, we take the time to take just the right amount off the floor and not over-sand, which takes skill and experience to achieve the right adhesion. 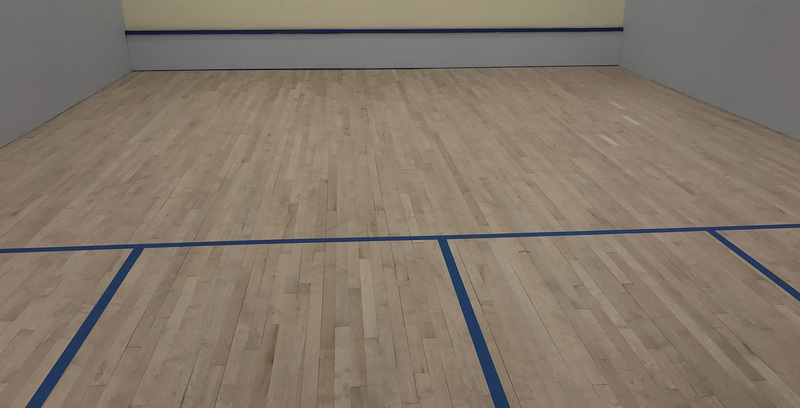 When installing a new squash court we recommend, as approved Junckers contractors, 22mm solid beech SylvaSquash flooring, with Junckers sprung batten or cradle system over a Junckers damp proof membrane sheet. Our experienced technicians can get courts back up to match play standard in the quickest time. All our works include a 12 month workmanship guarantee, which means that we take the time to ensure the works we carry out are fully project managed from start to finish. The Squash Racket Association recommend certain methods and materials which we ensure we follow when carrying out our works; we also use Armourcoat plastering, Armourcoat tins and outer court battoning. If you are considering refurbishing or replacing doors, contact us. If you would like the hassle of maintaining your squash court taken out of your hands, we offer a Managed Maintenance Service (MMS) where we agree with you the number of maintenance visits required to maintain your court for a fixed monthly price. This agreement offers peace of mind knowing that your court maintenance is taken care of.